The events of the last two years have restructured the traditional systems of global governance that have dominated the international order since 1945. As a wave of anti-globalization sweeps some developed nations, China, the world’s second-largest economy, is increasingly committed to openness and free trade. In light of the country’s economic success over the past 40 years, the world’s developing countries look to China, which is ready and willing to take the reins and usher in a new era of inclusive and connected development worldwide. In 2013, China launched the Silk Road Economic Belt and 21st Century Maritime Silk Road Initiative--known as the Belt and Road Initiative--which outlines China’s plans for the future of global cooperation. 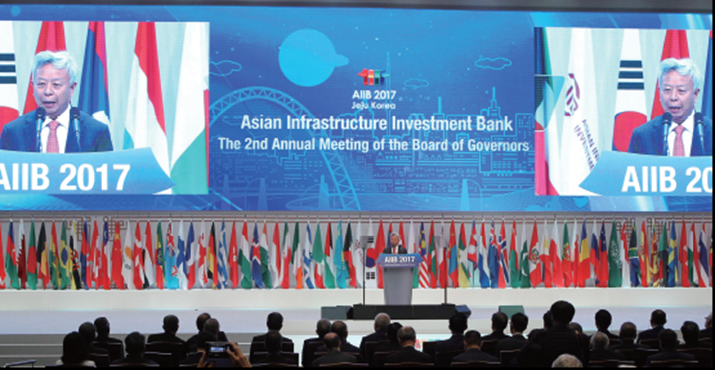 Through the construction of infrastructure projects funded by the Asian Infrastructure Investment Bank (AIIB), the initiative seeks to build or rebuild ports, roads and railway networks that can together resurrect the historical trading routes that once engendered a golden age of economic and cultural exchange. The Silk Road Economic Belt aims to bring the underdeveloped regions of Central Asia back into the global economic fold by connecting China and Europe by land, while the complementary maritime effort targets a pan-oceanic trade network linking Southeast Asia, South Asia, Oceania and the East Coast of Africa, and beyond. Green development is also central to this vision of the future, and China’s agreement to the terms of the Paris climate accord in 2015 proved a major factor in that treaty’s ratification. China continues its efforts to cut back carbon emissions. The synergy of green development and infrastructure construction will have significant implications for world development in the coming decades. However, questions remain as to how the AIIB, the financier of the Belt and Road Initiative, will function differently from its international counterparts in the funding of energy infrastructure against the current backdrop of green development demands. Can the AIIB go beyond simply replicating other international development banks, and adopt a new role as an innovative alternative to the existing finance system? Many countries along the Belt and Road are rich in resources, and harbor huge potential in untapped forms of energy. BP data from 2016 shows that, of the 15 countries with the world’s biggest oil reserves, eight are in regions along the Silk Road land route, as are eight of the 15 nations with the most natural gas and six of the top 15 nations for coal. This abundance of resources adequately furnishes the countries along this route with the assets necessary for fast economic development. Yet in spite of these natural endowments, substandard energy infrastructure has been a major hurdle to economic and social development. The latest World Bank figures show that in a large number of the countries along the Belt and Road routes, populations still lack universal access to electricity, with the per-capita energy consumption of half of these countries ranking lower than the world average. While raising living standards at home and abroad is central to the Belt and Road vision, energy consumption will increase alongside new economic development. When this happens, the need for adequate infrastructure will be clear--evident in China’s own development over the past few decades. The top priority for countries along these routes, therefore, must be to resolve the structural gaps between inadequate energy infrastructure and the ever-growing need for energy. The construction of such infrastructure will require large-scale investment and long time frames. Most of the countries along the Belt and Road are developing economies with limited sources of financing within their borders, and foreign funds are thus needed. However, many of these nations are not able to borrow money in the international capital market; nearly a quarter of the countries along the routes are not WTO members. Alleged low economic transparency among non-WTO countries impedes their ability to source funding from major international financial institutions, such as the World Bank and the International Monetary Fund (IMF), which constrains economic development and living standards in those countries. The AIIB aims to enhance the price and cost-competitiveness of local energy products. It is also important for the bank to establish a set of project evaluation criteria that is distinct from those employed by existing multilateral development-focused institutions. To improve the efficiency of production and transportation, the AIIB must focus on the construction of local infrastructure, and help countries along the routes cope with price volatility in the world energy market, as the imbalanced relationship between the production and consumption of energy resources in many countries leaves some oil exporters especially vulnerable to price fluctuations. In 2016, crude oil production in Iraq, Iran and Azerbaijan accounted for 5 percent, 4.9 percent and 0.9 percent of the world’s total output, respectively, but the proportion of consumption in these countries relative to total global consumption was very small, standing at just 1.9 percent in Iran and even lower in the others. The same trend is evident with natural gas. For example, in 2016, the annual production of natural gas in Turkmenistan was 2 percent of the world’s total, but the percentage of domestic natural gas consumption relative to the world’s total consumption was negligible. This ratio between production and sales is critically unbalanced. The AIIB should therefore focus on improving the international competitiveness of these energy products, increasing the development and security of energy through infrastructure and bolstering local profits in any future financing endeavors. When providing loans and finance, the AIIB must remain flexible regarding labor and environmental standards, selecting those that are compatible with the corresponding stages of economic development in the countries where investment is to be made. The world’s major financial investment institutions generally enforce a unified benchmark for labor and environmental standards, which tends to overlook the limited financial capacity of less affluent countries. A majority of the countries involved in the Belt and Road Initiative have low- and middle-income economies for which these expensive prerequisites for environment and labor simply should not apply. One potential solution is that such guidelines could be devised with the added goal of improving cost-competitiveness, where both labor and environmental standards could be built to accommodate different levels of development in different societies, thereby lowering the financial barriers to development among the countries along the routes. In this way, the AIIB can play a more effective role in the construction of energy infrastructure as part of the Belt and Road Initiative. It is also necessary for the AIIB to construct a more systematic policy evaluation system--one that seeks a balance between inclusive and green development. The generally low levels of economic development within countries along the Belt and Road naturally boast correspondingly low levels of carbon emissions. These countries should arguably be entitled to carbon emission permits that not only account for their minor contribution to the global carbon footprint, but grant them permission to capitalize on their energy resources in order to catalyze their own economic takeoff. However, the current major institutions concerned with global development, such as the World Bank, the Asian Development Bank, the African Development Bank and the European Bank for Reconstruction and Development, now unanimously insist on a one-size-fits-all policy for applications relating to thermal power loans, having terminated financial services for such projects. The use of clean energy is a global trend that fuels green development. However, the production of some clean energy sources, like wind and solar power, is weather-dependent and largely unstable, while hydropower is a resource governed by geographic constraints. In order to power the green energy revolution necessary to bring about environmental stability, the development, production, transportation and modification of green technologies--for now--still rely on some degree of thermal power. While the institutional one-size-fits-all policy is compliant with environmental protection standards, it nevertheless undermines the development of new energy industries in less developed nations, and imposes on them insurmountable financial barriers to opportunity. It now falls to the AIIB to think outside the “one size fits all” box and adopt a flexible financing policy and more empirical evaluation methods when choosing how to distribute funds along the Belt and Road. In this way, and by continuing to strive toward the long-term goal of environmentally sustainable development, the AIIB can provide financial support for developing countries in a way that other multilateral organizations right now are unable and unwilling to do. The author is a professor of the School of Economics, Renmin University of China.